Burgess’ Dead Solstice is the first chapter of a 14 part series. 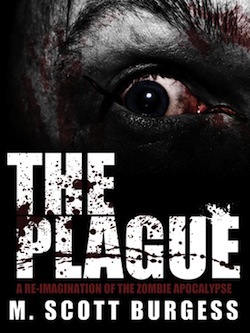 It follows the story of Dean Gothurd as he wakes up in a now zombie-infested Southern California and must work with his friends, and others he meets along the way, to find safety from the brain-hungry hordes of the undead in what is Burgess’ interpretation of the culturally popular idea of the Zombie Apocalypse. I thought it was also a funny read; funny but with the whispers of a clever plot just ahead. I like the pay as you go route that Burgess has chosen, because there is nothing worse than putting out hard earned money for a dead fish book… unless of course your down with necrophilia, which might be possible because you are considering buying a zombie story! Let’s just hope there are no overbearing romantic tropes to trudge through in the rest of the series. I was wrapped up in the story all the way until the end. It had a great balance of suspense, true to life dialogue, and humorous color. Zombies aren’t a genre that I am normally interested in; they really genuinely creep me out… but I can’t wait until the next episode. This is a winner, in the right place and just in time for a quick read before Halloween!